This week’s article was written by CUESA volunteer Stacy Ladenburger. 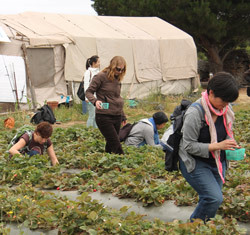 On a recent CUESA farm tour, an eager group of strawberry enthusiasts embarked on an adventure to Dirty Girl Produce and Happy Girl Kitchen Co. to learn about growing, picking, and preserving strawberries. Dirty Girl Produce owner Joe Schirmer cultivates strawberries along with more than 20 varieties of vegetables on 34 acres spread across three sites. We visited the Watsonville location, kept warm by the Santa Cruz Mountains to the northeast. Joe led us around the organic farm, pointing out the beans (six varieties, planted in waves to keep the market stalls stocked), basil, and green coriander, a crop unfamiliar to many on the tour. These small, round pods, which appear on cilantro plants after they have flowered, encase the coriander seeds. Tasting them, we discovered that they snap delightfully in the mouth and boast a bright flavor. The dry, hot climate is perfect for Dirty Girl’s famous dry-farmed Early Girl tomatoes, which crop up in the late summer, but it is a challenge for strawberries, a fruit less fond of heat. 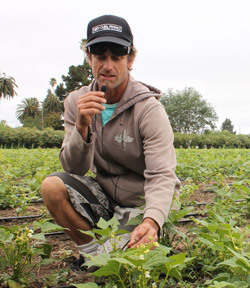 Still, Joe has found a rhythm, and he is now in the middle of his 14th year of strawberry farming. 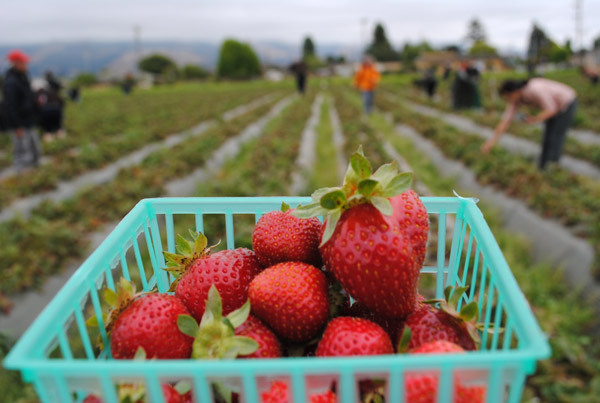 Most conventional strawberry farming begins with fumigation and sterilization of the soil, often using methyl bromide and other toxic pesticides that have been criticized and even restricted but nonetheless remain in use. Dirty Girl Produce has held organic certification since it was founded in 1995, and despite the challenges, the farm maintains its commitment to sustainability in the berry patch. Joe rotates his crops to improve soil fertility and control insects and disease. Instead of chemical fertilizers, he uses kelp meal, and this year, he also experimented with mustard seed meal, a natural fumigant alternative, with positive results. Hedgerows elderflower, coyote bush, and other shrubs sit at the edge of the farm, attracting beneficial insects that help keep pest populations in check. Dirty Girl Produce grows two strawberry varieties, Seascape and Albion. This year, the farm planted 60,000 Seascape and 11,000 Albion plants. Both varieties begin producing in the spring and continue well into autumn. The Seascapes, however, are sensitive to day length, becoming dormant in June and bouncing back as the days begin to shorten. The berries differ only slightly in appearance. Seascapes are round, with the achenes (the small nodules that contain the fruit’s seeds) resting on the surface of the berry. Albion strawberries are more conical, with their achenes slightly recessed. Some people harbor strong opinions about which variety is best, but Joe says that in blind taste tests, preferences are usually split 50/50. “People ask, ‘Why are your strawberries so good?’ It’s because we pick them when they’re ripe,” Joe remarked. The white shoulders and tips found on many grocery store berries indicate underripe berries, which are easier to transport and last longer on the shelf but are severely lacking in flavor. Ripeness is not the only important factor during harvest. Picking strawberries is a difficult task, one that requires precision and care. It is best to pick in the morning, when the stems are firm after the plants have been drinking water all night. Joe calls these berries “snappers,” because their stems are easier to break. Later in the day, the stems will become fibrous. The farm crew tackles the harvest together; though the work is demanding, it takes them only two hours to complete it. As we approached the plants to pick a few berries ourselves, Joe told us to look for completely red strawberries boasting full, rich color and a bit of shine. He instructed us to turn a strawberry’s stem at 90 degrees and snap it, leaving the green calyx (or hull) attached to the berry. We made our way down the rows slowly, searching for fully ripe berries and gently bending the stems to pick them. Though the work demanded careful attention, we enjoyed the task of harvesting our own food. With our ruby-red bounty in hand, we bid a grateful goodbye to Joe and his beautiful farm. After our strawberry harvest, we made our way to Happy Girl Kitchen Co. in Pacific Grove. 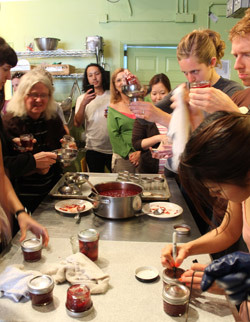 Owner Todd Champagne led us through a jamming lesson using Dirty Girl strawberries, explaining in detail how to make top-notch, low-sugar preserves and letting us get our hands dirty in the process. With a delicious meal of vegetarian chili, cornbread, and salad in our bellies and small jars of strawberry-lavender jam in our hands, we made our way back up the coast. The day’s adventure had left us all the more enthusiastic about these small, red fruits that enchant us each summer. Visit Dirty Girl Produce at the Ferry Plaza Farmers Market on Thursdays and Saturdays, and Happy Girl Kitchen Co. on Saturdays. Join us for our next farm tour to Happy Quail Farms and Iacopi Farm this Sunday, July 28. Sign up.